Under the Patronage of the UAE Minister of Economy, H.E Sultan bin Saeed Al Mansouri, the Securities and Commodities Authority (SCA) in cooperation with the Union of Arab Securities Authorities (UASA), organized SCA Annual Conference and the First Forum for Arab Securities Brokers on Monday 23rd April 2018 at Grand Hyatt Hotel – Dubai. The event was attended by more than 300 participants from experts, specialists and researchers in securities, investments, brokerage and oversight bodies from around 40 countries, in addition to a number of senior officials from UAE, Arab Countries and Europe. In addition to the opening session and the Keynote speeches, the conference included four panels; The first panel discussed the regulatory framework and the role of regulators in developing capital markets while maintaining a balance between the financial stability, investor protection and market efficiency. This panel discussed also ways to deal with the default of a market intermediary and to contain systemic risk, default risk and market disruption by reducing risks and improving the professional requirements of the financial brokers. The second Panel presented the impact of financial technologies on capital markets, the immediate challenges facing financial markets infrastructure and market structure enhancement, through the discussion of the role of the financial technologies (FinTech) and Cyber resilience in facing cyber financial crimes. During the panel, the Abu Dhabi Securities Exchange presented its experience in Implementing the Block chain. The third panel, entitled “the foreign investment and post trade transparency”, discussed a number of topics especially the openness of Arab Markets (Exit policies), Emerging Vs. 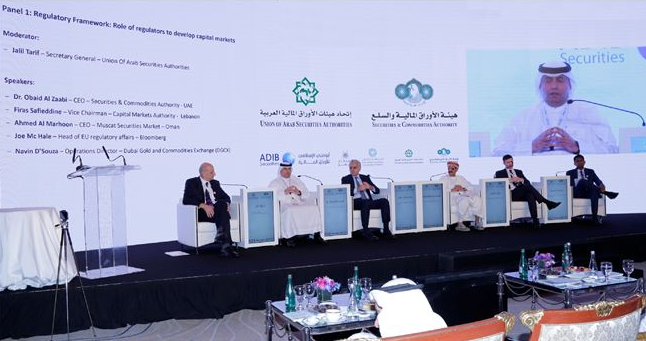 Developed markets, The challenges facing the Omnibus Accounts and the direct market access (DMA).In addition, the panel discussed the role of CCPs in Arab Markets and the Derivative markets. The fourth and last panel discussed the issue of self-capacity building in the Arab financial markets and its challenges, especially in the areas of financial intermediaries, research and market analysis, this paned explored also the ways and means to strengthen intermediaries' governance, professional certificates, education and continuous training. In addition, the panel discussed the challenges facing the fixed income and Islamic Sukuk markets.